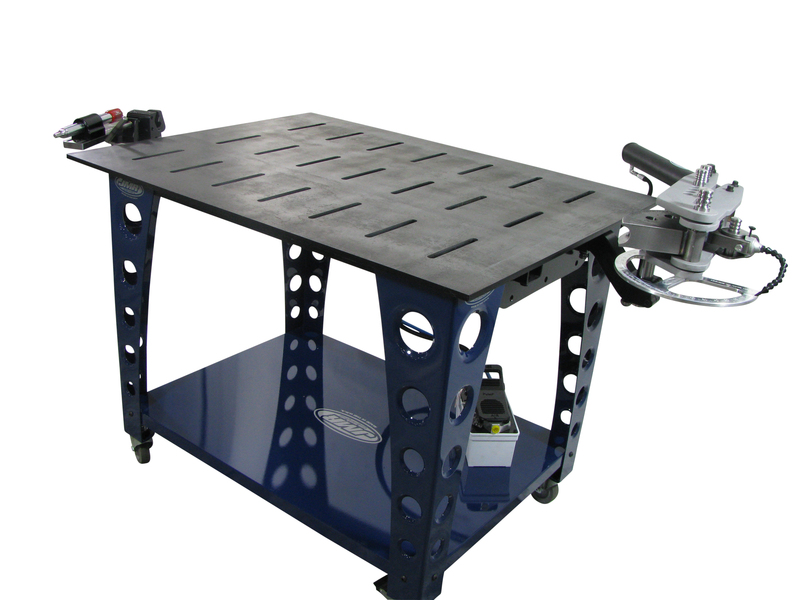 Trick-Tools would like to announce their newest addition to their extensive line-up of welding tables, the Fabrication Table from JMR. This table features a 36 x 48 inch slotted steel top surface that accepts threaded T-nuts, just like a drill press or mill would use, for maximum flexibility in workpiece holding. A unique feature about this one of a kind table is the receiver hitch style framework beneath the tables surface. The hitch framework is intended to mount accessories such as a tubing bender, notcher, bench grinder, vise, or whatever you can dream up. The tray underneath allows you to store necessary supplies including the 1/2″ T-slot hold down kit and 90 degree slotted angle plate that is included with the purchase of the table. For more information on this product, visit the Trick-Tools website at www.trick-tools.com or call us at 1-877-826-7268.